It was a sultry day, the kind of day you could fry an egg in. The temperature rose to the upper 70’s. Still, there was a hint of a summer’s breeze about that if you rolled the car window and drove through it, the coolness of the breeze felt like a soothing mist. Everyone was out and about. We saw a car that was broken down by the round-a-about. The passengers abandoned the vehicle and were sitting on the green waiting patiently for Roadside Assist. We took the Citeron Saxo to the Tesco Car Wash. The old girl had not been washed in ages. The car passed through the automatic car wash. The experience felt as if we were going through a tropical rainforest. The shampoo they used created a rainbow of crazy colours which kissed every inch of our red Citeron Saxo. We stopped at the John Allen Centre to buy a packed lunch from the local Sainsbury’s. The car park was buzzing with people who were busy buying things in the shopping centre and carrying their loot to their cars. We took a differenct route than normal, driving through Cowley Centre. Cowley Centre was packed with cars, buses and cyclists. One lady was outside a florist. She was arranging flowers in the basket in front of her bicycle. She gaily drove away. Cowely road is a busy thoroughfare in Cowely. It is the international mecca in Oxford. It is dotted on either side with Asian, Indian, Pakistani, French, Italian, Polish and American markets, restaurants, Bistros, Patisseries and shops. Cowely Road reminds me of my familiar Bergenline Avenue back home. Of course, Bergenline Avenue is and was a classier sort of Avenue. It is called the Miracle Mile because of its concentration of retail stores and commerce. In the 1960’s and 1970’s, Bergenline flourished with classy shoppes, restaurants and cafes run by Italian and Cuban merchants. We drove through Oxford City Centre. This bus driver nearly ran into us. The burke should have driven straight ahead instead of trying to turn into a narrow side street! The driver stood for a good three seconds just watching what Alex was going to do. Alex drove stratigically around the bus. We drove to Port Meadow in Wolvercote. Port Meadow was crowded with people having Barbecues and people walking their dogs. Yes, it’s officially summer! It’s officially summer when the first smoke of a smouldering barbecue goes up in the air. We had our lunch there in the car park. I had the Southern Fried chicken wrap from Sainsburys. It was delicious! Alex had a pork roll. We stayed there until we finished our lunch, then we hit the road and drove on through the English countryside. 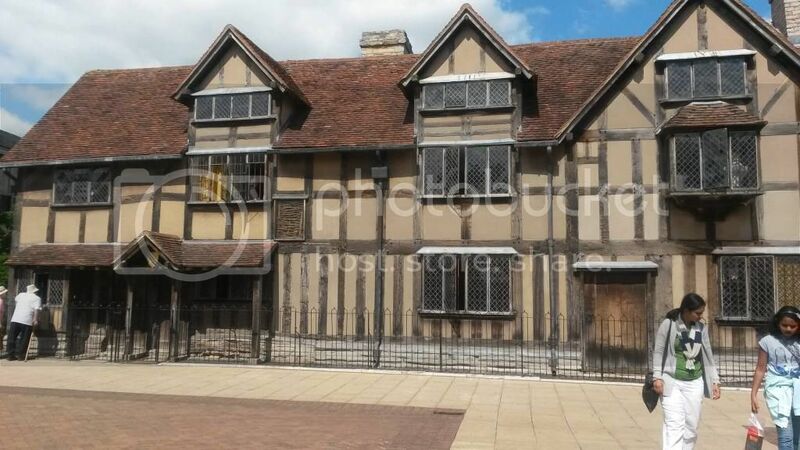 We drove to our favourite haunt, Stratford-On-Avon. 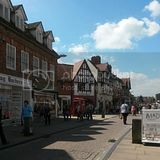 Stratford-On-Avon was also buzzing with life; full of tourists and students busily walking around. We walked up to Henley Street where Shakespeare’s Birthplace is located. We went into Patisserie Valerie, which used to be called Druckers. We had not gone in here for ages. I had a Doube chocolate Ice-cream cup. Alex had a Pistachio Mint Ice-cream cone. The chocolate ice-cream I had was creamy and cool. Patiserie Valerie has the most delicious Menu! The prices are semi-affordable. We got caught behind a Route Master bus on our way home. The Route Master had a sign that said Novelty Tours. It travelled all the way from Warwickshire to Oxford. There’s a Bus Museum in the village of Long Hansborough. There were a lot of faites and carnvials going on around Oxford and the surrounding villages. We also saw a lot of Rolls Royce. One particular Rolls was in service transporting a Bride and Groom to their Reception Hall. The bride, a young twenty-something was dressed in white and had the most joyous expression on her young face. She was full of hope and dreams.